Stems: Solitary or few, erect to ascending, unbranched, moderately to densely long hirsute. Leaves: Opposite, simple; oblanceolate to narrowly elliptic, 4 to 7 inches long, 1 to 2.8 inches wide, base attenuate, not encircling stem, margins ciliate, apex acuminate or occasionally acute, surfaces moderately hirsute, veins often canescent. Inflorescences: Solitary flowers in axils of upper leaves, sessile, each flower subtended by pair of leaf-like bracts as long or longer than flower; bracts linear-lanceolate to narrowly elliptic, sparsely pubescent. 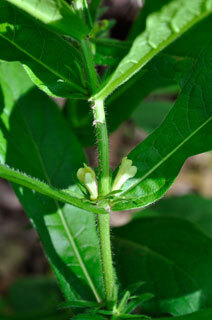 Flowers: Calyx 5-lobed; lobes linear to narrowly triangular or narrowly lanceolate, .3 to .5 inch long, .04 to .08 inch wide, sparsely hirsute, margins entire, ciliate with long and short hairs, apex acute to obtuse; corolla pale yellow, salverform, .5 to .6 inch, 5-lobed, outer surface with gland-tipped hairs; stamens 5; style included. Fruits: Drupe, pale orange, spherical, .2 to .3 inch diameter, moderately to densely hairy; nutlets usually 3, tan to straw-colored, ellipsoid.